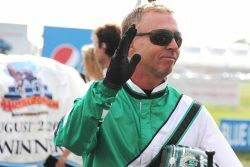 Hightstown, NJ — As soon-to-be-retired trainer Jimmy Takter prepares for his final Breeders Crown appearance Saturday at The Downs at Mohegan Sun Pocono, he is focused on his horses in the hopes of adding to his astounding accomplishments in the series, which in recent years has become his playground. Jimmy Takter prepares for his final Breeders Crown appearance Saturday at The Downs at Mohegan Sun Pocono. USTA/Ken Weingartner photo. For Saturday’s complete card, click here.